ZixMail Pricing starting at $95 per user.. Buy and Renew Zixmail online. ZixMail pricing as low as $95 per year. (Minimum quantities apply). Ideal for individuals and businesses with less than 10 users, ZixMail is a desktop email encryption solution that encrypts and decrypts emails and attachments with a single click. ZixMail is the desktop email encryption solution that provides individuals with a high level of security in their email communications. It’s an easy-to-use service that lets users encrypt and decrypt emails and attachments with a single click. ZixMail can be downloaded and installed in minutes, and it integrates with corporate email systems and Web-based email. The service provides automatic retrieval and distribution of public encryption keys through ZixDirectory, the world’s largest email encryption directory. ZixMail employs the most efficient and secure way to deliver messages through ZixCorp’s unique Best Method of DeliverySM. This ensures email can be securely sent to any user, anywhere and on any mobile device. Sentinel Cloud Service Brokers guarantees the lowest ZixMail Pricing on the web. The above ZixMail pricing is only available to new customers. To view your ZixMail account information. 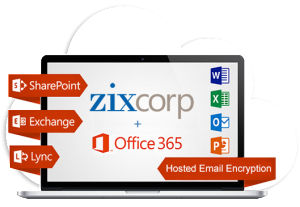 Upgrade your email to Microsoft Exchange from Office 365 bundled with ZixGateway in one easy transaction for less than the cost of a ZixMail license. Hosted Email Encryption with Office 365 from Nimbus Logic will give you enterprise class email and best of breed email encryption from Microsoft from a single source. ZixGateway with Exchange Online Plan 1 priced at $99 per year for single user license with annual commitment. If you are interested in a multi-user ZixMail license for your organization or want additional information about our solutions, please contact us. Want to add the benefits of ZixPort? The Zix Professional Bundle includes 10 ZixMail licenses and a custom ZixPort at a significant savings. How do I contact Zix customer support? What operating systems is ZixMail compatible with? I don’t remember my ZixMail Signature Phrase (password) or I don’t have my ZixMail Signature file. What do I do? If you DID NOT create a Recovery File or an export copy of your Zix Signature, or your Zix Signature is not Active, email ZixCorp Support for further options. How do I change my ZixMail Signature Phrase (password)? You may change your Signature Phrase in ZixSignature Manager. On the Actions menu, click Edit Signature. The Edit ZixSignature page is displayed. Change Signature Phrase Only, if for example, you want a Signature Phrase that is easier to type or to remember. Change Encryption Codes and Signature Phrase, if your company security has a policy that requires you to change your encryption code at certain intervals. ZixCorp will force a change in encryption codes every 10 years. Type your new Signature Phrase. It must be at least one character long. Re-enter the new Signature Phrase. Select Yes to save a copy of your Signature so that it can be recovered in case your disk crashes or you forget you’re Signature Phrase, and then Browse to a location to save it. Note: Write down and save the file name/location for future reference. When you edit a ZixSignature’s encryption codes, the status is set to New and the Zix Worldwide Signature Server sends the change confirmation email to your email address. If you do not respond to the confirmation email within 24 hours, your prior ZixSignature is reactivated. Once you activate your edited ZixSignature, and you click the Update Status button, the edited ZixSignature’s status will change from New to Active. Note: If the edited ZixSignature also resides on another PC, you must export the ZixSignature to copy it to the other PC. Also, don’t forget to update your backup file with the revised ZixSignature. How do I renew my ZixMail subscription? Regardless of where you purchased ZixMail, you can renew your ZixMail subscription here. For ZixMail licenses purchased after 2015, we now have an automatic renewal for your convenience. You will receive a reminder 7 days before your credit card is charged if you wish to cancel. Additionally, you can check your subscription expiration date by going to the renewal page, click here. Return to the renewal page after the expiration date so that you can extend your ZixMail subscription. Does ZixMail support images in the body of a message? ZixMail does not currently support images in the body of a ZixMail message. All files or images must be sent as attachments to the message. What do I do if I did not receive a confirmation email when creating or changing my zixmail Signature Phrase (password)? Verify that your confirmation email was not captured in a SPAM filter or was placed in your Junk folder. See the FAQ “What do I do if ZixMail messages are being categorized as bulk or SPAM by my mail provider or desktop software?” to see how to whitelist Zix messages. If you do not respond to the confirmation email within 24 hours, the Zix Worldwide Signature Server automatically deletes the ZixSignature. By deleting the signature, the private signature code (private key) will remain on your local computer and your email address remains in ZixSignature Manager with a status of Unconfirmed. Using the ZixSignature Manager, you need to delete the Unconfirmed ZixSignature from this computer only, before creating a new ZixSignature. What is the largest file attachment size supported in ZixMail? The standalone version of ZixMail utilizes ZixCorp’s mail server to deliver email. You can attach up to 10 files with a total of 10 MB, uncompressed. Note that the larger the size of the file, the longer it may take to upload and download. Can ZixCorp employees view my secure messages? No. ZixMail servers receive the mail securely over SSL and store the messages using triple DES encryption. Intended recipients must use their passwords to open email messages. Why do I get the “incorrect Signature Phrase” error message when trying to recover my zixmail password? This error can indicate something as simple as mistyping your Phrase. The Signature Phrase is case sensitive and must be entered exactly as created, so please check spacing and your CAPS LOCK key. If you are still unable to open your ZixMail Signature file with your Signature Phrase, you should attempt to recover your Zix Signature file. Please refer to the “I don’t remember my ZixMail Signature Phrase” FAQ. Why do I get a “Server Connection Error” when I try to create a Zix Signature or send a ZixMail message? Please check to make sure you are connected to the Internet. If you continue to get this error, the most common reason is a personal firewall running on your PC. If you have a personal firewall installed, please try temporarily disabling the firewall to see if this resolves the issue. If the firewall is blocking your ability to connect to the Zix Signature Server please make sure the firewall is configured to pass traffic over HTTP port 80 to and from wwss.zixmail.com. You can also verify the connection going to http://wwss.zixmail.com/zix where you should see the message “You have reached the ZixIt KeyServlet [WORKING]”. For more information on configuring your firewall, please contact your firewall manufacturer. The most common reason for this error is a network firewall or proxy server that is blocking traffic to or from wwss.zixmail.com over port 80. Your local IT Department should be able to allow this required connection. Please contact us at support@zixcorp.com if you need further assistance. How can I upgrade my version of ZixMail? To upgrade your version of ZixMail, please click here. What do I do if ZixMail messages are being categorized as bulk or SPAM by my mail provider or desktop software? Most providers have a unique method to distinguish SPAM and valid emails. Please check your bulk email box or Junk folder for Zix messages and work with your mail provider or configure your desktop software to reclassify them as valid emails. If you are in a corporate networking environment, the confirmation email may be blocked or quarantined by your mail server’s anti-spam software. Please check your quarantine or work with your local email administrator. The confirmation email may have also been delivered to your “Junk” folder. Additionally, you need to contact your IT department and have them whitelist smtpout.zixmail.net, which is IP addresses 63.71.8.100 through 63.71.8.109 for inbound mail. Is there “Help” Available for ZixMail? You can access the ZixMail “Help” menu by selecting “Help” > “Help Index” or by pressing the F1 key. This is usually caused when you confirm your Zix Signature, but do not open Zix Signature Manager and click “Update Status”. Please open Zix Signature Manager and click the “Update Status” button. This should change your Signature status in Signature Manager from “New” to “Active”. Why There is no ZixMail button in my Outlook toolbar? First, please confirm that you are using the full Microsoft Outlook program (as opposed to Outlook Express). ZixMail for Outlook does not integrate with Outlook Express. If you are using Outlook, look in the Menu Bar at the top of your Outlook window for a ZixMail dropdown menu (it should be to the left of the Help dropdown menu). If you do see the ZixMail menu, this means that ZixMail has been integrated into your Outlook software. It is probably just a matter of choosing the right tool bar options to display the red ZixMail “Z” button. Click the “More Buttons” icon (small downward-pointing arrow) at the far right of the Standard toolbar and choose “Add or Remove Buttons” to temporarily view any buttons that may be hidden due to insufficient room on the toolbar. If “ZixMail” is present, click on it to add it to your Outlook toolbar. Why can’t I see the ZixMail button in my Outlook Express Toolbar? The current ZixMail for Outlook plug-in is designed for Microsoft Outlook integration only. However, the ZixMail desktop (standalone) version works with any email client, including Outlook Express. Because ZixMail is not integrated into Outlook Express, the ZixMail button does not appear in your Outlook Express toolbar. Messages arrive in your Outlook Express inbox, just like any message with attachments. Clicking the attachment opens the ZixMail standalone product. You can reply or forward within the ZixMail product and your messages are secure and private. What versions of Outlook are ZixMail compatible with? While trying to install ZixMail for Outlook 2007, the error “The customization cannot be installed because another version is currently installed” is displayed. First, verify under the “Add Remove Programs” verify that no previous ZixMail installations exist. If no other version of ZixMail is detected, then based on your PC configuration and other software installed the ZixMail for Outlook plug-in will not install on the PC. You will have to install the ZixMail (stand alone client). When I try to decrypt a secure email I get a popup dialog stating “Internal error”. When I try to encrypt a message with ZixMail for Outlook 2007 I get a dialog stating “Internal error”. The ZixCorp Outlook plug-in has a conflict with your PC configuration. In order to be able to encrypt and decrypt messages you need to uninstall the Outlook plug-in and download and install the ZixMail (stand alone client). One you have it installed you will be able to encrypt and send secure emails using the ZixMail (stand alone client). My ZixMail plug-in keeps disappearing from the Outlook application. This is caused by a conflict with another plug-in within Outlook 2007. First check to see if ZixMail has been disabled by opening Outlook and clicking on help from the main menu bar, then click on disabled items. If ZixMail is listed, highlight ZixMail and re-enable it. If ZixMail is not listed, you can go to Tool/Trust Center/add-ins then in the Manage drop-down box at the bottom of page, select “COM add-ins” then click “Go”. Write down what you currently have checked, then uncheck all add-ins. Check the ZixMail add-in and save. Then close Outlook and reopen. If the ZixMail plug-in is back, then add the other plug-ins back in one at a time to see which one there is a conflict with. Once you determine the conflicting plug-in you can either leave it unchecked or if you need that plug-in, then use ZixMail standalone as your encryption/decryption solution. Is ZixMail for Outlook 2007 supported in the Citrix environment? ZixMail is not supported in a Citrix environment. Can I use email encryption on a Mac or another non-Windows device? While ZixMail can only be used on the Windows Operating System, users of Mac®, iPhone®, and other non-Windows devices have a couple of options for sending encrypted emails with ZixCorp products. Licensed users can use the Secure Message Center, located at https://zixmessagecenter.com/, to compose and read secure messages. The Secure Message Center will expire messages typically after 14 days. If you’re wanting to retain these emails for a longer period of time, you’ll need to back them up to your local machine, by downloading the email and any attachments. As a plus to using the Secure Message Center for your secure messages, you’ll be able to access them using a mobile device. Since you will be accessing a Secure Message Center site, any device with an internet connection and a browser can login to view the encrypted messages, as long as you know the correct login information. If you were using ZixMail or ZixMail for Outlook on Windows and have recently migrated to another device or operating system, ZixCorp can remove your existing ZixMail signature. This will allow your encrypted emails to be delivered via the Secure Message Center. No additional purchase or licensing is required. If you were using ZixMail on Windows, and have an active signature, we will need to deactivate your current signature key. You will be able to send and open encrypted emails on the Secure Message Center after the deactivation process and, you will still be able to open older emails that were encrypted with the older, now deactivated, Zix Signature. If you are just starting with Zix, this is not a problem. However, if you’re migrating to a Mac and have had our desktop service for a while, it is recommended that you decrypt and back up your Zix messages that you have already received. How do I install ZixMail? The registered user will need to download/install ZixMail and will also need to create a Zix signature phrase (password). The steps below will assist the user with creating a signature phrase. Please follow the steps below to create a Zix Signature. If you have not already done so, you will need to download the latest version of ZixMail. 2. Press the “Create New” button. How do I remove my ZixMail private key manually? How do I deactivate my ZixMail Signature? On the next screen you will be asked to confirm your email address once more. Then, press the “Next” button. 5. Enter and confirm your Signature Phrase. This is the password you will use to encrypt or decrypt ZixMail messages. 6. On the next screen, once both progress bars have reached 100%, click the “Next” button. 7. Then, Select “YES” to create a Recovery File and press “Next”. 8. Select a location to save your recover file by clicking the “Browse..” button. Then click “Next”. NOTE: Please ensure you save this recovery file to a safe location where you can easily locate it. Such as a USB device, or network share. 9. Once the status bar on the next screen reaches 100%, press “Finished”. 10. Open your regular email inbox. 11. Locate the confirmation email and click the “accept or decline” link. If you do not receive the confirmation email, please refer to the “I did not receive a confirmation email” article. 12. Click on ACCEPT to activate or DECLINE if you would like to start over. 13. Once the status has reached 100%, Return to the ZixSignature Manager. 14. Press the “Update Status” button to activate your new Signature! If you are using ZixMail Stand Alone for the first time, you must now configure your SMTP options. How do I reactivate my ZixMail software after it expires? Once a ZixMail license has been renewed after expiring, we will reactivate the ZixMail license on our end. The only thing the end customer may need to do is go into the signature manager under options and click on “update” in order to refresh. That should change the status from suspended to active. If I have a ZixMail trial will I need to do anything special if I purchase? No, As long as you specify the same user names during your purchase, your trial will be converted to a paid subscription and you will not have to reinstall. Where can I download ZIXMAIL?